On the 125th birth anniversary of India’s first prime minister, RIR looks back at his special relationship with the Soviet Union. Right wingers critical of Jawaharlal Nehru tend to blame his Soviet leanings and what they term ‘Nehruvian Socialism’ for the problems that India faced in the decades that followed independence. Although Nehru admired the USSR, he was anything but a proponent of blindly replicating Soviet systems in India, and his relationship with Moscow was not without complications. Born with a silver spoon, Nehru was educated in Cambridge, where he first picked up his leftist leanings. He did not actually visit Moscow until he was 38 years old. On his way back to India from Europe in 1927, Nehru along with his father, sister and wife visited the USSR for the 10th anniversary celebrations of the Bolshevik Revolution. For a detailed account of this trip, read this highly informative article by Dr Arun Mohanty. Nehru was obviously impressed with what he saw in the Soviet Union, given the fact that the authorities of that time would have shown him the best of what the USSR had to offer. In The Discovery of India, which he wrote while in jail, the economic ideas proposed by Nehru clearly demonstrated his belief in Socialism. Some even argue that the very reason that the British divided India was their certainty that under Nehru, the country would become a Soviet ally. They needed a vassal state that would be an ally against the expansion of communism, something that came to use when the Soviet Union fell into the Afghanistan trap decades later. However, Nehru’s friendship with the British (despite everything the empire did to India) made the USSR suspicious of the charismatic Indian leader. Nehru was termed an agent of bourgeoisie and counter-revolutionary forces! “The Soviet military circles reasoned that in the event of a war with the United States, Britain and her allies in India, being a member of the British Commonwealth, would inevitably act as an enemy of the USSR, and the Indian airfields and other military-strategic facilities would be used for bombing raids along the southern borders of the Soviet Union,” Valery Kashin wrote in a detailed article about Joseph Stalin’s views on Nehru and Mahatma Gandhi. It was after the death of Stalin and when Nikita Khrushchev was at the helm of Soviet affairs that India-USSR ties truly began to blossom. 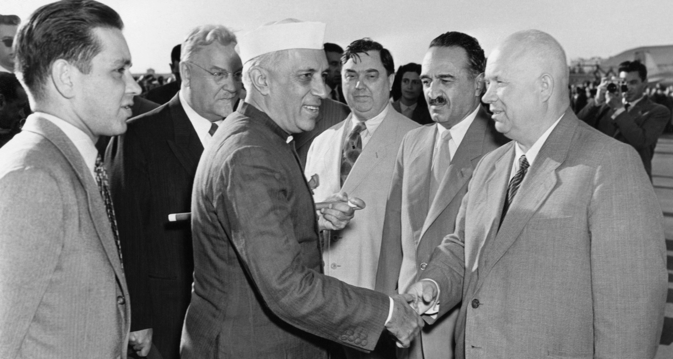 Nehru’s well received 1955 visit paved the way for Soviet assistance in constructing the Bhillai and Bokarosteel plants. Nehru also invited the Russians to set up the Indian Institute of Technology in Bombay. The Americans and Germans followed suit with offers that were accepted by the statesman that Nehru was. Throughout his time as prime minister, he was open to good ties with all foreign countries and was one of the founders of the Non Aligned Movement (NAM). This did not particularly irk the Soviets as they were happy enough to have allies that were not part of the Communist bloc. Even countries like Cuba joined NAM. The USSR also did not support its communist ally China during the 1962 border war with India. Many historians argue that this was one of the first causes of the cooling of ties between the communist neighbours. Nehru died two years after the war, and is fondly remembered in Russia. There is a Jawaharlal Nehru square with a bust of the leader in Moscow’s Vernardsky Prospekt. This statue was sculpted by D.B. Ryabichev. Of course, Nehru’s first name is a tongue twister for many Russians and the square is known as “Ja” square. It is located near the Moscow State University’s metro station. Both India and Russia have moved on from their experiments with socialism, but their ties are so deep rooted that ideology and political disposition are not of any consequence. It was Jawaharlal Nehru’s statesmanship and vision that laid the foundations for this friendship.